Proven chassis shows even more durability and maintenance features. New design Touch Starter provides stress-free engine starting! Great for racing in the KYOSHO CUP! Belt driven 4WD delivers on driver-friendly control and dynamic speed that supports beginners to experts, from your first race all the way to racing glory. The breathtaking racing performance of the V-ONE SIII has evolved to an even higher level with the Evo. The low and wide design results in a lower center of gravity that combines with the same suspension system used on the World Champion V-ONE RRR and a 2-speed transmission. And the awesome power of the GXR15 engine roars to life with a simple push on the battery unit of the compact Touch Starter that also features an LED that indicates the condition of the glow plug. This machine is full of special design features that make it worthy of the ‘Evo’ name and extend its racing performance to a new level.  As the officially sanctioned machine for the new 2008 KYOSHO CUP rules, the Evo is also lower in cost so you can enjoy the best racing experience without high levels of stress and cost!